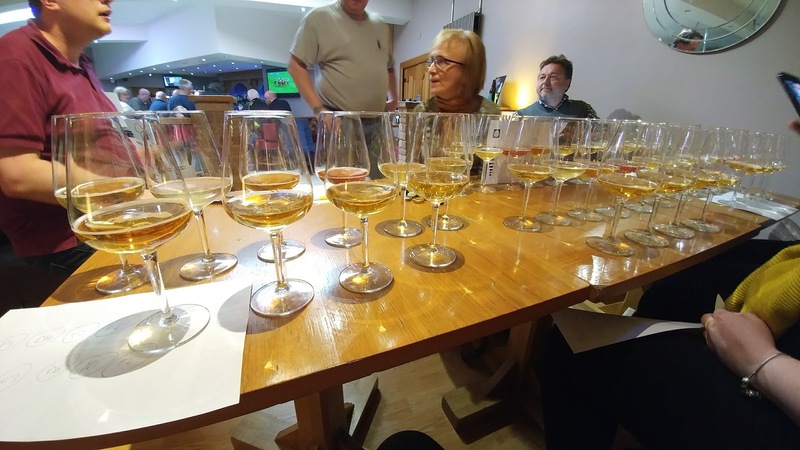 I blogged about this back in February, but what I didn't mention is that Steve Lamond, Beoir's Cider Officer and author of Beers I've Known, had invited me to judge at it. So Friday evening last (21st April) I travelled up with Reuben Gray (Beoir Chairman, The Tale of Ale blogger) and Andrew Moore (author of the BeoirFinder app) to Steve's house just outside Dungannon, Co Tyrone, stopping off on the way at Balbriggan to collect the final entries from David Llewellwyn of Llewellyn's Orchard fame. Steve has quite a cellar of beers and ciders, and Friday evening was spent making a noticeable dent in that (thanks Steve!). But I digress. Saturday morning we were whisked off to The Roadside Tavern in Stewardstown where we met our fellow judges, author and blogger Pete Brown, Susanna Forbes, Beer & Cider Editor for the magazine Imbibe, founder of DrinkBritain.com, and boutique cider maker at Little Pomona cidery, and Caoimhe Nic An tSaoir, general foodie and the driving force behind Scullery Made. After some quick introductions it was 11 o'clock and time to start. Pete, Caoimhe and I were on the dry category to start with, with Susanna and Andrew on the not-dry. Seventeen entries in dry, the majority of them commercial but a few amateur ciders in there too, before moving onto the speciality entries of which there were four. The other team finished the smaller not-dry category before moving onto fruited ciders and perries. Best in category winners were chosen at that point by each team. Ten entries in total made it to the Best of Show round where every judge was involved. This was more of an elimination round but once it came down to the final four or five it became seriously difficult to place as it really was cream of the crop stuff. Judging finished up just before 5pm and shortly afterwards a few commercial cider makers popped in, just in time for the awards ceremony. When all done and dusted judges, organisers, stewards and some commercial cider makers headed to The Brewer's House, a beautiful gastro brewbup in Donaghmore for some of the most amazing food I've ever had. Highly recommended! I'm absolutely delighted that Davy Uprichard, from whom I've been buying cider apple juice for the last number of years, scooped the top spot and more, but well done to all and especially to Steve and his main squeeze Daisy for being their hospitality and making sure everything ran like a well-oiled machine. The judges were unanimous that there was a gulf in quality between commercial and amateur ciders and as I moderately experienced amateur cider maker I know that you can't just bung yeast in a random apple juice, wait for a few months and expect to have commercial grade stuff. The right apples are mandatory, usually a blend, and so is proper back sweetening (with real juice, nothing artificial), even if it's only slight. Or residual sweetness from keeving, but that's not for the faint-hearted. No overall winner chosen but all 4 entries highly commended for efforts.